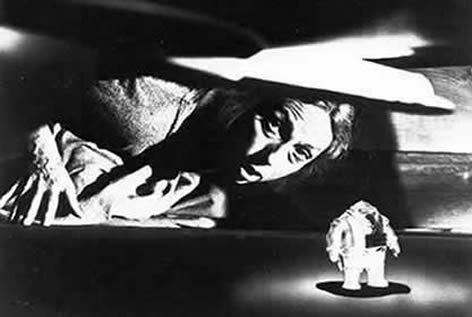 sean owens as a woman attacked by space creatures in this adaptation of an old twilight zone episode. no dialog; thus, all the sound effects. sean owens, sara kraft and i in a series of disturbing vignettes written by mr. owens, including "you will never love again" and "buried alive by the hottest guy". i was up in the rafters. all about prison and lumps and stuff. 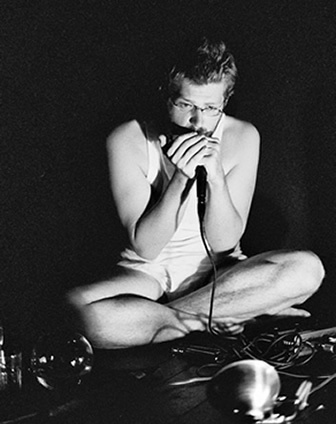 there was a lot of really fun music in this show, all harmonicas and fishbowls and pieces of metal being whacked around and fed through a delay pedal and sounding all fucked up and stuff. but i never really recorded most any of it. 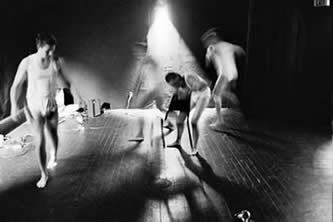 "the intimate swap" is a studio (ha!) 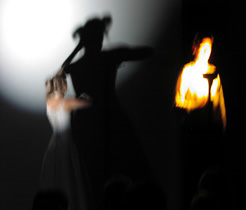 version of one of the pretty scenes in the play, in which two actors swap clothes. 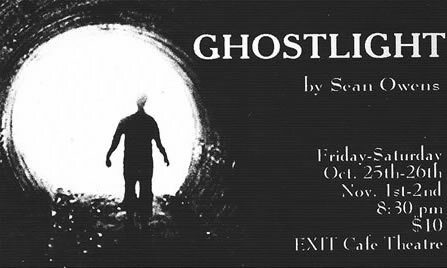 "The simple costumes, the stark use of practical lighting, and the beautifully simple live music and sounds all are accomplished with enough imagination to overcome their repetitiveness and make the piece stylistically engaging. the cast has a strong physical connection to each other and an excellent sense of spatial awareness, which compliments the lyricism of the script nicely. It is, in fact, the clear dedication of the ensemble to both the material and to each other that ultimately makes Gulag Ha Ha successful." 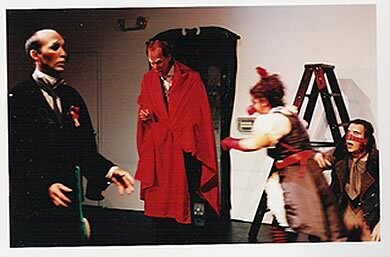 a clown opera adaptation of nikolai gogol's "the nose", "the overcoat" and "diary of a madman", this show opened the exit's third theater, on taylor street. it was a beautiful mess. "Owens and Craig interweave the three stories, with one actor dedicated to the main role in each story, while a chorus of clowns plays all the minor roles. 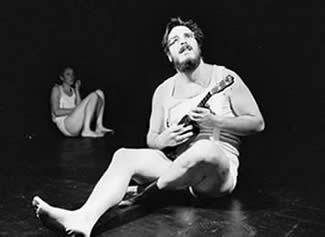 The authors utilize music (the wonderful klezmer- and folk-inspired score is by David Malloy, and performed by Malloy and several of the company members on piano, harmonica, harmonium, accordion and spoons), songs, absurdist monologues and intentionally bad jokes to tell their stories...funny and harrowing." "a delirious musical whirl that captures the Russian master's lyrical absurdity...David Malloy's live music is festive and eclectic."